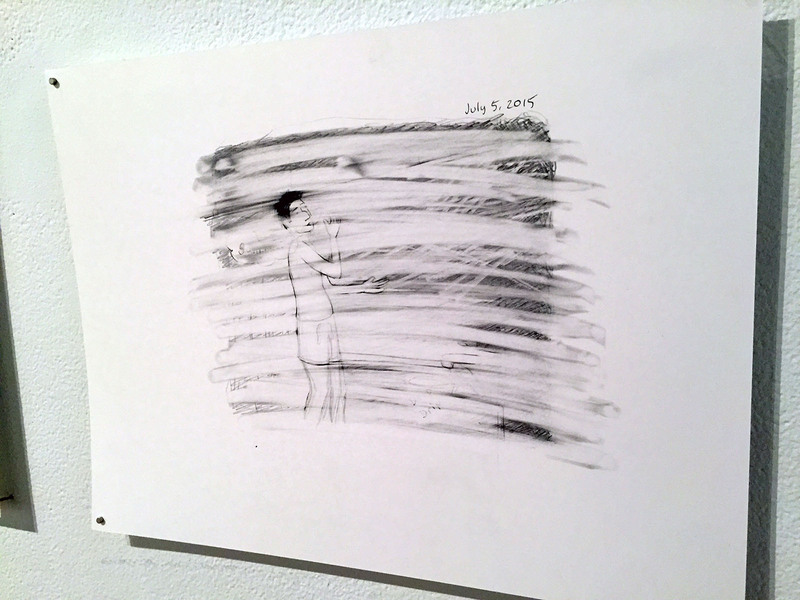 This week we were lucky to have Pittsburgh based artist John Pena as a visiting artist. Lately, Pena has become most known for his daily autobiographical comic “Daily Geology“. The actual drawings look COMPLETELY different from the way they appear online. 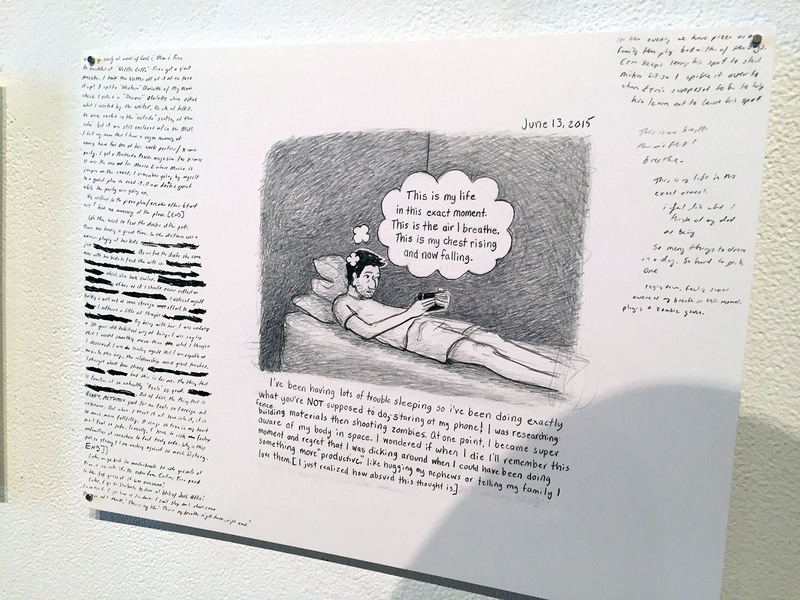 Like the above drawing, there are notes about the drawing or its text in the borders which speak to the challenges of this entire project. The drawings themselves look much more nuanced. You can see much more line work, much more tonal development in the shading. Its possible that because they are in the gallery right now, I am responding to them in much more traditional ways as “ART”. But online, I overlook a lot of this nuance and beauty because I am responding to them much more as autobiographical comics. These are my favorite. When it seems like the process of doing a daily drawing is too much, but John has to produce SOMETHING. His willingness to show these is why I love artists who work in such ways. It would be easy to categorize this as a failure, but it could just as easily be seen as a challenge to our traditional notions of drawing. I can’t help but think about Gary Simmons when I see this. 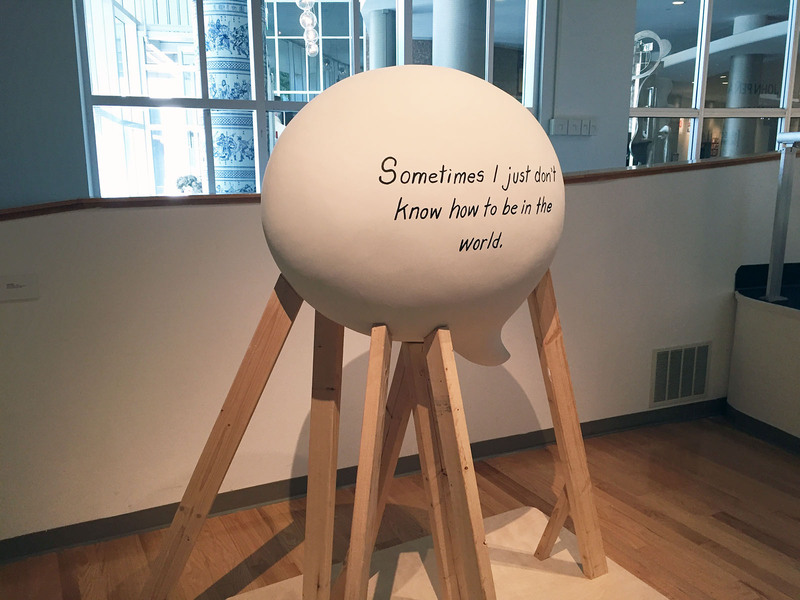 This talk balloon sculpture is from his installation at the Mattress Factory this year, which was an amazing installation. John gave a fantastic talk to our students on Thursday. It was funny and honest, just like his comics. I really admire artists like John, who are willing to try all kinds of things and at the same time can be dedicated to a singular project. “It is my pleasure to introduce today’s visiting artist John Pena. John lives and works in Pittsburgh and received his MFA from Carnegie Mellon University in 2008. 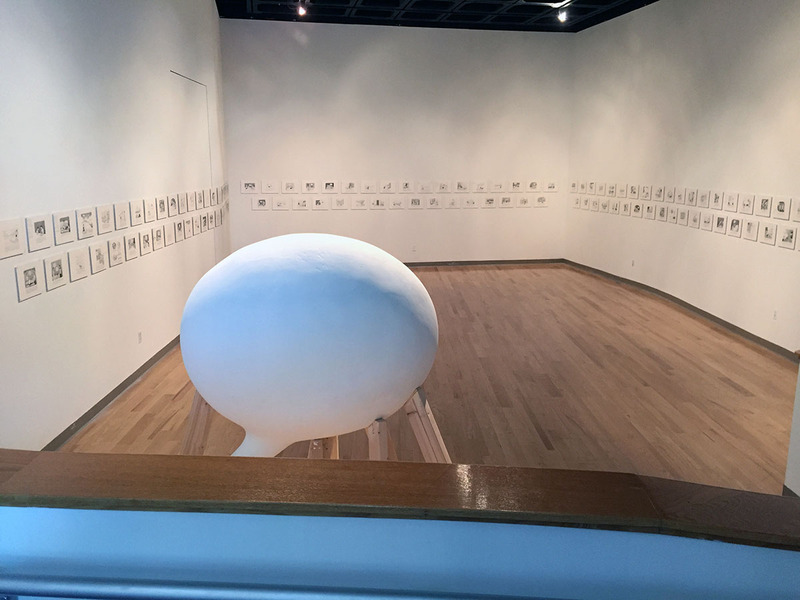 In a very short amount of time, John has garnered a national reputation for himself, being asked to attend residencies at Skowhegan and at The Bemis Center, he has received a Fullbright Fellowship, and has shown his work all over the country, most recently at the Mattress Factory. While his accomplishments are quite impressive, I would like to take a minute to explain why I think it is exciting to have John here today. While on the surface these works may not seem related, I like to think three things link them all: absurdity, discipline, and sincerity. 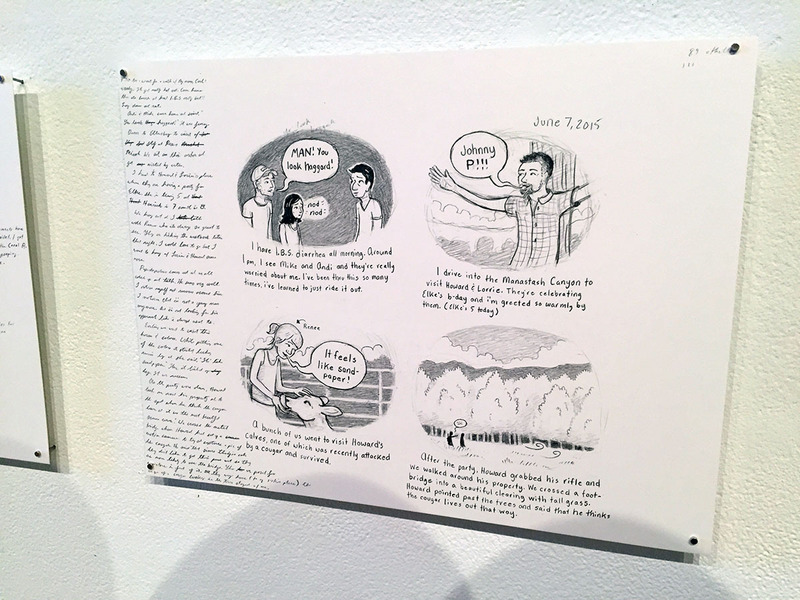 Absurdity: In his “Daily Geology” project, featured in the exhibition upstairs, John attempts to sum up an entire day’s experiences in one drawing, and by doing so he is taking the tradition of autobiographical comics to an absurd level. Discipline: It takes discipline to go through the process of choosing a single moment at the end of the day, then figuring out how to draw that moment and its characters, and then giving every drawing a summation, and then going through that process everyday for six straight years. And sincerity: it takes sincerity, to be brutally honest in each day’s depictions, which point out the complexity and poignancy of one’s life, his hopes, successes, struggles, and fears.